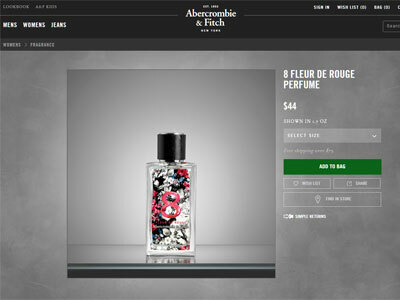 8 Fleur de Rouge by Abercrombie & Fitch - A new floral oriental fragrance that includes the flirty scent notes of black pepper, jasmine, amber, and musk to create a mysterious rich feminine fragrance. This edgy fragrance launched in 2015 is available as an eau de parfum from Abercrombie & Fitch stores nationwide. Package Design Original 8 Perfume bottle with floral print and pink 8 label with black cap.